Season chicken with Italian seasoning, salt and pepper, to taste. Melt 2 tablespoons butter in a large skillet over medium high heat. Add chicken, skin-side down, and sear both sides until golden brown, about 2-3 minutes per side; set aside. Melt remaining 1 tablespoon butter in the skillet. Stir in spinach and cook, stirring occasionally, until it begins to wilt, about 2 minutes; set aside. Gradually whisk in chicken broth, thyme and basil. Cook, whisking constantly, until incorporated, about 1-2 minutes. Stir in half and half and Parmesan until slightly thickened, about 1-2 minutes. If the mixture is too thick, add more milk as needed; season with salt and pepper, to taste. Place chicken in a single layer into the prepared baking dish. 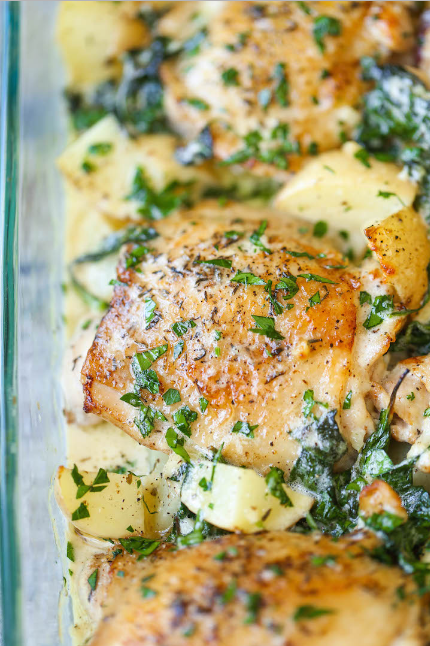 Top with potatoes, spinach and cream sauce. *Potatoes can be cut into thirds or fourths to ensure quicker cooking time. *Half and half is equal parts of whole milk and cream. For 1 cup half and half, you can substitute 3/4 cup whole milk + 1/4 cup heavy cream or 2/3 cup skim or low-fat milk + 1/3 cup heavy cream.